Materials: Titanium, pure silver, 440C stainless steel. 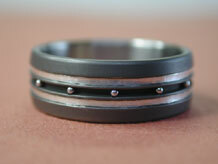 Description: Titanium (3)channel band with stainless steel balls with silver inlays on either side - approx. 7mm wide.